You could literally sell me my own soul with the hook of: a cast of female pirates. I will read basically everything with that tag line because that’s the type of person I am. Throw in some mermaids, some legends, and treasure? Sold. That’s why Over Raging Tides was a book I knew I’d have to read. First off can I just say that I need the sequel right now? That cliff hanger ending is where I’ll be until the next one – just saying. Okay, Over Raging Tides is fast paced and entirely fun. There is an all female pirate crew with betrayal, secrets, and battles. 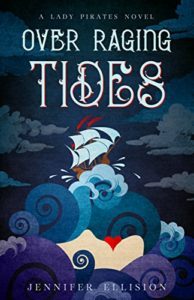 This book is perfect for pirate fans and those who want fierce heroines. It features a strong and feisty crew of female pirates who go on adventures, escape perilous situations, and visit pirate islands. I do wish there was more on the side characters, the pirate crew, but this is the first in the series that will set up the foundation for the series. (Also the sequel promises more diving into another side character, so I am not mad at all). The history of the crew and our main characters are peeled back as the story goes on. It’s definitely a good start and I hope there will be more depth of characters and history as the story goes on. I can’t wait to read more about Grace’s family, her backstory, and the mystery behind the map. My interest is piqued for more! Check out Over Raging Tides on Goodreads. After reading Daughter of a Pirate King, I’m all in with female pirates too. I’ve read this author’s books before and will be checking out this one too.